In this instructable, I'll go over what a printed circuit board is, where they are used, and the basics of how to make one yourself. So sit back, strap in, and enjoy learning about this very important and interesting method of making electronics! Note: this is an introductory guide. I'm sure that there is a lot I did not cover, and if you find something you think I should mention in this guide, make sure to put it in a comment below! A common method of prototyping circuits. Great for building temporary circuits and some quick projects. Similar to conductive ink: cool and novel, not too practical in most cases. However, some cool uses in wearables! A Printed Circuit Board (or PCB for short) is a different way of connecting electrical components together. It is made out of a non-conductive material, usually fiberglass. However, there is a layer or multiple layers of copper over the board, which lets you connect components when the copper is etched away in the correct patterns. The board in the image above was made with a CNC machine which mechanically removed a copper layer in specific places to allow components to be soldered on and through the board, and be connected together in the right way. While this one isn't, many are then coated with a solder mask of a certain color, often green (but not always) that helps solder stick to the right places. PCBs are in almost everything electronic; computers, mice, electric scooters, refrigerators, screens, phones, and countless other devices. The first step to designing a PCB is knowing what you want to make. There can be a lot to designing a PCB, or it can be extremely simple; it completely depends on what circuit you're making. But whatever you end up making, it's helpful to have a program to organize it all for you and give you the tools you need to turn a schematic (abstract diagram of all the parts and connections you need) to a final layout for your circuit board. From there, you export your file and can send it off to be fabricated. Component placement: where are your parts? Step 4: Want to Make a PCB? So you want to make a PCB? Well good, there's tons of different methods you can use. Probably the most effective and easiest way is to send your gerber files to a fab house. These take the files you created in your circuit creation program and fabricate a board for you. I'll go over these a bit more in the next step. You can also use a CNC machine to create your board if you have access to one. I've personally used a machine at work made by LPKF, which is specifically designed for making circuit boards and the Othermill by Other Machine Co. The Othermill is designed for hobby grade CNCing, and can carve out 3d shapes into blocks of soft material or mill away a double-sided copper clad board to create a PCB. A popular option for getting PCBs is to have them made by a fab house. These are professional facilities that handle construction of possibly thousands of boards a day. Each fab house is of varying quality and has different tolerances of trace width, hole size, and other specificities like cutting slots so you should do your research before sending your files out anywhere. PCB Shopper lets you compare multiple different fab houses and determine what place is right for your needs. Once you have your bare PCB, the next step is adding your components. These need to be soldered on, but there's more methods than just doing everything by hand. I know I said there's other methods, but as long as you don't have huge components and a steady soldering iron, placing components by hand is still a great way to go as long as you don't have dozens or hundreds of boards to solder. So get those tweezers out! Pick and place machines automatically grab components and put them onto the right spot on the board. These are really cool machines! You should look up a video of them in use, it saves tons of time in assembling electrical assemblies. However, these are very expensive! Your fab house might offer to do placement if they are adding components, in which case they might use this machine for large quantities of the same board. Reflow ovens can be used with either pick and place machines or placing by hand but are generally for surface mount parts. Solder paste is first applied before component placement. Then, the PCB is placed in the oven, and temperature increased and then brought down again at a precise interval. This is hot enough to melt and reflow the solder paste, securing all components to their pads, but not too hot to damage any components. This has been somewhat replaced by reflow ovens due to increased popularity of surfac mount components, but is still an effective method. Heated solder is pumped up in a wave shape, and boards passed into the wave to quickly solder multiple components to a PCB. There's also some different and pretty cool types of PCBs. Flexible: These boards can bend and twist. While not used very much, they can be useful when a device needs to be small and light, such as in wearables. 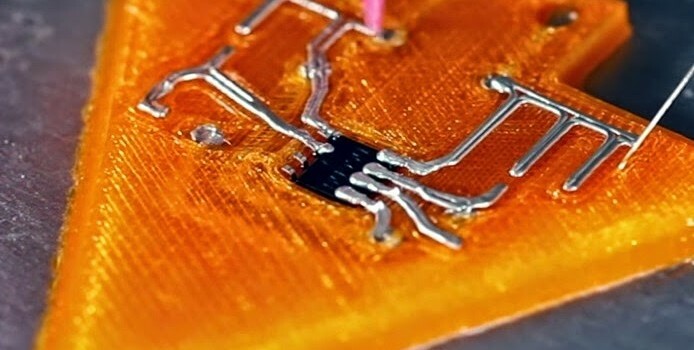 3d-printed (Voxel8): At least one company now is making a 3d printer that can integrate conductive traces with printed plastic layers. This way, electronics can be integrated with mechanical parts; all in three dimensions. These technologies are not too popular at the moment, but could possibly be used more and more if price comes down. Make sure to keep an eye out for future flexible and 3d printed products! Thanks for reading my instructable, and I hope that you learned something new about PCBs! I use a free toll called EasyEDA for design and make my PCBs. Once your project is finished on https://easyeda.com, you can order your PCBs right from the same interface at a competitive price, which could be very helpful for beginners who don’t know where to send the design files to fabricate PCBs. I use SprintLayout there is correction at print dialog. And when You print a sheet becomes a few smaller, You should try print one point one or 2 times, then print Your pcb image. And make correction, If it's need. Big video from first link, step-by-step guide(with comments (titres only)), other files are not processed videos and photos of other PCB including 2-sided. Real resolution which can be achieved down to 0.1 mm(depends from printer at most) . Seeed Studios Fusion PCB service. I've used PCBExpress's software and boards for many years and always been impressed by the precision and speed. I've done boards that ran at 5.8 GHz, using microstrip design rules (which are way different than low frequency stuff). It would be good if you mentioned how to design a PCB. I use FritZing which is free software which allows you to design a PCB and they will then sent it to you for a very low cost. Check out my page, I have a step by step with photos that will help you. Try using express PCB software it is also free, or if your happy with yours that is fine too. Then buy you some heat toner transfer paper from ebay. For the top layer it is fine to print directly to the paper. But for the underside of the board print to the paper in mirror image. Clean you copper clad with steel wool. use a hot iron and iron the top layer on first. before ironing on the other side I would suggest drilling a couple of holes to align the other side before ironing it on. Then just etch it normally, there you go a nice looking PC board. Some photos of the old board. The other half of the board was ok. I used jumpers to connect the traces. I made my own repair board for my Yamaha amp with a hand made layout and a small tip in a hand grinder. Sure, I could have used a Bridgeport mill but that would be too easy. My amp is fine and has been working for 4 years. It doesn't look store bought but all traces are fine and I added component holes after grinding. The board was only 3" by 2 1/2". A cap blew my old board. I started the amp up after repair with a dim bulb (voltage reduction) device and it was fine. The circuit in that area has around 20 devices(caps, resistors, diodes and scr's) for the power area. Interesting, thanks for sharing. I've been using the toner transfer method for a few years. I keep thinking about using a fan house, but I'm still not sold when I can do it myself inexpensively. I just wanted to comment on the pick and place machines. I worked at a factory that placed components for customers and actually worked with both wave and smt lines. both are extremely fascinating. I've been thinking I might actually build a small pick and place machine when I finish up school. Thanks for sharing this, I enjoyed the read. In Step #1, you mention several options for making circuit boards yourself. One option that, while not overly popular, is quite manageable for the hobbyist and great for high-frequency work known as Manhattan-style construction. Make did an article on it, and I did an Instructable using it. The pros are no etching and great high-frequency capabilities; cons are careful planning and difficulty in making complex circuits. In Step #5, you show a big picture of a full, purple panel from OSHPark which seems to have originated from an episode of the AmpHour but ironically don't mention them. Design my PCBs using Altium Protel program, export the holes map with DXF format and import directly ArtCAM 9.0. Where to create the path of the holes and use a CNC. I use many years the toner process by thermal transfer, made a laminator using a printer fuser laser and my boards are perfect. I even double-sided boards. With a resolution of 0.2 mm. I recommend you modify the list of companies in Step 5. Olimex no longer makes PCBs. The first 5 PCB manufacturers in your list are the same company. You don't show some of the most popular current PCB manufacturers. Lady Ada's list, which you have a link to, is old. As geo bruce said, you should point readers to PCBShopper. It's a price comparison site for PCB manufacturing and it's being actively maintained. It's also objective: manufacturers can buy ads on the sidebar, but they don't buy their way into the price comparison list. PCBShopper also has a list of free CAD software (PCBShopper.com/cad) that you might want to reference in section 3. There are many such lists on the web, but PCBShopper's is nice because it tells you what the limitations are in the free versions of commercial CAD programs. Thanks for the info, I'll make sure to update that step! Well done for all the physical & mechanical info, but my biggest concern at this juncture is what software to use to generate the 'eagle' files, or whatever other standards that may be out there. The process of creating/designing the circuit board, and even the circuit and then packaging up the definition for the board fabs is what I'd like to hear about. I did see your short list, but little other commentary. I guess the software does much of the work but selection and pricing are difficult when you're uninformed (as I am).